It was one of those trying weeks some years ago, the kind most families experience, when our three children, at the time preschoolers, came down with colds that developed into ear infections and strep throat. Between calling the doctor and flipping through parenting books to check symptoms, my husband and I fretted over our little ones, taking their temperatures, coaxing eyedroppers of children’s Tylenol and antibiotics into their wiggly little mouths, and rocking them late into the night to soothe their discomfort. Like parents everywhere, we rejoiced when they bounced back to their sweet and silly selves, triumphantly running around the house with more energy than ever without any sign of having been feverishly sick days before. My brother Eugene caught scarlet fever and was later paralyzed on his left side, never really regaining full use of his left arm. He was about 3 – 3 1/2 years of age at the time. 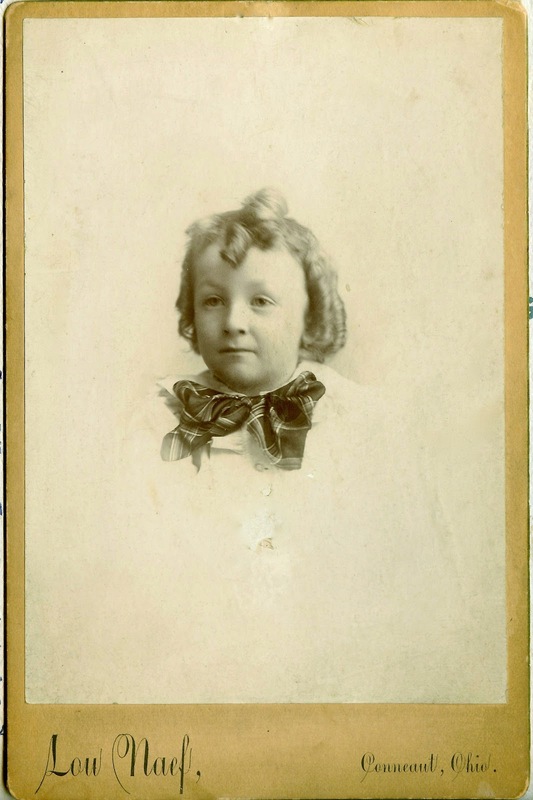 Called “Gene” after his father, Francis Eugene McGinnis was born on September 16, 1891, in Conneaut, Ashtabula County, Ohio, the second of four children, to Thomas Eugene McGinnis and Mary Jane Gaffney. We, he and I, were playing Indians. We had feathers in our hair and were going to capture our mother and John, the baby, in his playbox beside her sewing machine. We ran in from the apple orchard, shouting at the top of our lungs. Just as we neared my mother, Eugene fell to the floor. He was deathly pale. My mother sent someone uptown for the doctor. Dr. Upson came at once and put Eugene to bed. He examined me, too, but said I could stay on the couch in the kitchen. We had scarlet fever! I can’t recall that John ever got it, but Eugene became paralyzed before he was better of the fever. My mother’s hair was blue black then. Before (Eugene) was better, her hair had turned pure white. 19th century parents worried about their children just as parents do today, but the stakes back then were higher. Illnesses such as scarlet fever, diphtheria, and whooping cough claimed the lives of many children and left long-lasting effects on others. My husband’s and my efforts to coax flavored antibiotics into our children paled with the treatments most 19th century parents faced. A family medical guide of the time prescribed home treatment according to severity. My great-grandmother, Mary Jane, would have given her mildly ill Benita a recipe of Epsom salts and acetate of ammonia, along with a diet of mutton tea, toast, and barley or rice water for the first few days. Luckily, Benita seems to have recovered fairly quickly. Gene, however, worsened over the next few days. It is likely that he became bald – not because of the fever itself, but because his parents had to shave his head, for fear that the presence of hair could cause brain affliction and eventual death. In the cases of severe throat ulceration, parents were supposed to use a camel’s hair brush to apply a solution of nitrate of silver to the throat, “morning, noon, and night.” If you ever have had to hold a sick child still while the doctor swabbed his or her throat to check for strep infection, you can only imagine what a trial this must have been – not only for the worried parents but also for their terrified children! But this was not the worst of it. For the sickest children, doctors prescribed bloodletting from the head or the arm. Applying two to six leeches to each side of the head, just under the ears, was thought to relieve the brain of undue symptoms and presumably prevent death. No wonder my poor great-grandmother’s hair turned white. Though we do not know whether Uncle Gene had to endure the latter treatment, it is certain that scarlet fever left an indelible mark on him. He was partially paralyzed on his left side for the rest of his life and suffered from physical and emotional scars as a result of his left leg being shorter than the right. His classmates teased him because of his deformity. My mother, who was very close to him, said he never complained of his afflictions. A self-effacing man, he tried to mask his pain in various ways, performing in vaudeville for a few years and later, living for a short time as a Trappist monk. He had never quite recovered from his childhood disease, and as his health worsened, he came to live with my parents shortly after they were married. He died in 1956 at the age of 65 and is buried with his parents at Holy Sepulchre Cemetery in Chicago, Illinois. Thanks to modern medicine, scarlet fever today is not only preventable but highly treatable. We have ready access to doctors, advice nurses, and antibiotics, all of which make it easier for children to be healthy and carefree and parents to breathe a little easier. And that is something for which we all can be thankful. Did you know the McGinnises, or are you a member of the McGinnis or McCormick families? If so, share your memories and comments below. I enjoyed your well written and interesting post. Both of my paternal great-grandparents lost children at a young age due to illnesses that would be curable today. Through research, I've learned some of the women in my direct line died during or after childbirth. Most of those deaths could be prevented today as well.